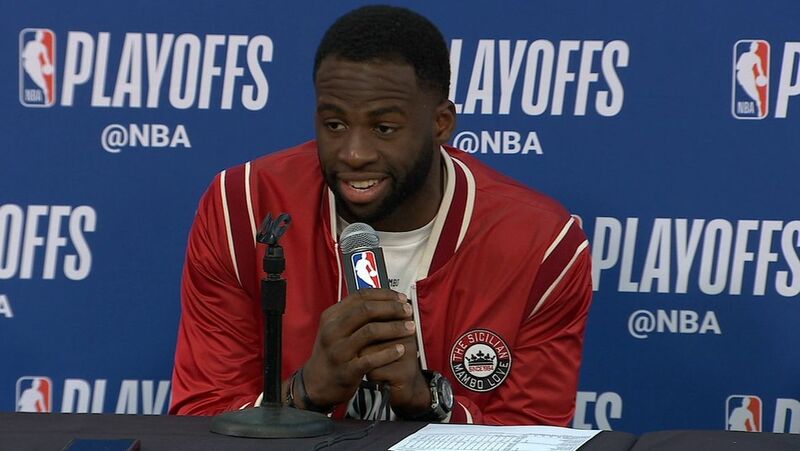 NEW ORLEANS -- Draymond Green wants the truth to be told. The Golden State Warriors' All-Star power forward said he's not the one in this Western Conference semifinal series initiating the multiple encounters he's had with New Orleans Pelicans guard Rajon Rondo. "I haven't been getting into it with Rondo," Green said adamantly after the Warriors' 119-100 lossin Game 3 on Friday. "You've seen me get into it with people before. When have I gotten in into Rondo this series? Maybe once. I wouldn't even say getting into it, though." The question then was reworded as "face-to-face" encounters. "That's basketball," he snapped back. "You're going to be face-to-face with somebody. That's how you guard." Most of their confrontations have occurred during stoppage of play. "Oh, OK. How many times have I walked up to him?" Green asked. "I haven't got into it yet with him, period." Rondo claims Green is indeed the instigator. "Nah, that's his game," the point guard said. "I don't try to bait him at anything. He talks a lot of s--- and that's part of it. We're competing. I don't think it's nothing more than us battling on the court. He's a great competitor, and I love competing against him. I'm just trying to match his intensity." "He's as hard-headed as they are," said Pelicans coach Alvin Gentry about Rondo. "I don't think you're ever going to see him back down from anyone. He's an unbelievable competitor, he's a great team guy, he's going to stick up for his teammates. He's just one of those guys -- he's not going to back down from anyone. I understand that. I just tell him he's got to know when to let it go, though, because obviously it would be a huge loss if we would lose him in a situation like that." Green does have an argument. In their first encounter, it was Rondo who walked near the Warriors' bench at the onset of halftime. They bumped chests and began jawing back and forth before players and coaches pulled them apart. And then late in Game 3, it appeared as if Rondo tried to trip Green from behind as the forward was walking toward his bench during a timeout. That prompted another face-to-face encounter. "It's kind of just how I am," Rondo said about his competitive nature. "I don't know if that's really trying to set an example. It's just guys talking trash on the other team -- it's kind of just natural for me to respond. Not in a crazy way or anything, just let them know we're not a pushover. We're here to fight, and with my guys on the court, I'm going to fight as hard [as] I can for these guys -- whatever it takes." However, Green isn't completely in the clear. In the middle of the first quarter on Friday, the Pelicans called a timeout, and Rondo tried to attempt a 3-pointer, a routine most players partake in to get in a shooting rhythm without it counting as an official field goal attempt. It also has become routine for opposing players to attempt to deny the free shot. Green guarded Rondo while both teams walked to their respective benches, and the two eventually began lightly shoving each other. Two officials quickly intervened and separated them. The reigning Defensive Player of the Year is adamant that he's not the one baiting. "Nah, I don't have to try to bait Rondo," Green said. "I get nothing out of trying to bait Rondo at anything. That does nothing for me. So, once again, when have I went up to him and tried to bait him? Y'all hate the storyline of somebody trying to bait me. I actually got to be involved. Like, 'Draymond's doing this.' At some point, somebody got to tell the truth. It ain't Draymond this time. I've baited a lot of guys. I've tried to bait a lot of guys, succeeded quite a bit. Sometimes failed. I ain't trying to bait nobody." Gentry said Green is playing by the book. "I don't think anything he does crosses the line because -- he's the perfect guy because if he's on your team, you love him, and if he's not on your team, you despise him," said Gentry. "To me, those are the kind of players that I'd like to have on the team. All he does is win. Wherever he's been, he's won. And so what I think you have to do, you have to play well enough to win the game, then that right there does all the talking. But he's going to talk, and I appreciate it. I saw him today -- we spent 20 minutes together. And I appreciate who he is and how he plays and what he's all about, because he's all about winning. And if you're verbally weak, then he's going to take advantage of you. I think our guys understand that at this point in the game." Green and Rondo both dismissed their brush-ups as frivolous, but Green was serious in reiterating that he wants accuracy from the media in telling how these incidents have come to be. "At some point, somebody has to tell the truth, and I know that's not quite the DNA these days of people telling the truth," Green said. "But at some point, y'all got to tell the truth. Draymond ain't trying to bait nobody. I'm chilling. Playing basketball. I look forward to y'all telling the truth one day. Maybe it won't happen. I ain't expecting it, but I do look forward to it." Golden State leads the series 2-1. 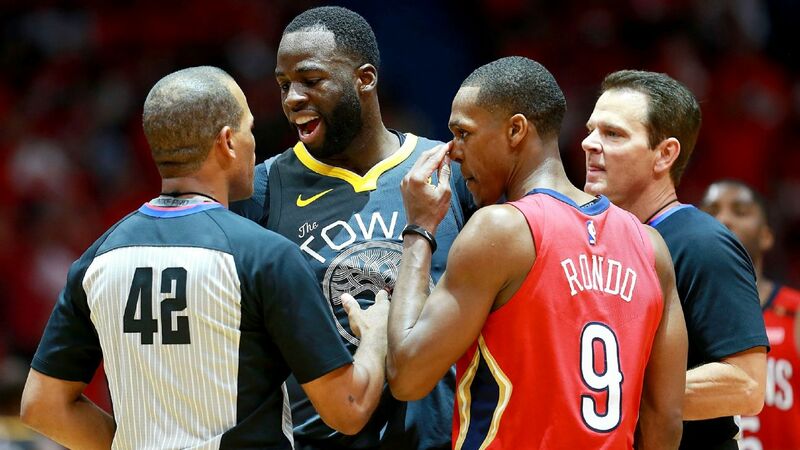 Draymond Green knows the Pelicans are trying to lure him into a technical foul and says he isn't trying to start anything with Rajon Rondo.